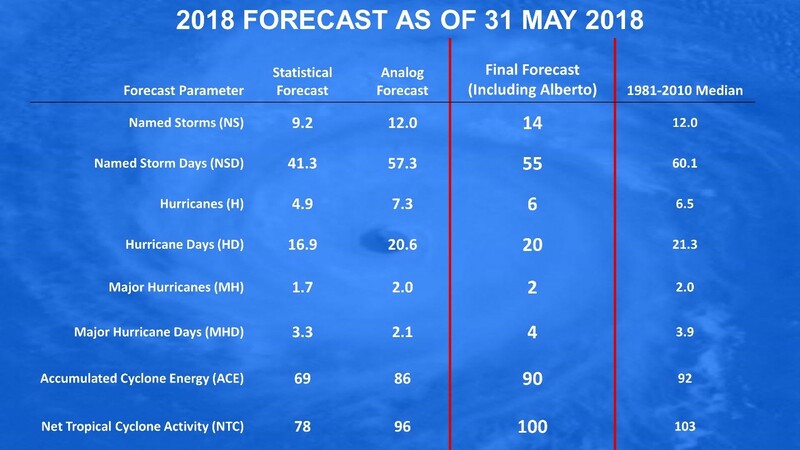 Colorado State University (CSU) has just updated their outlook for the 2018 Atlantic hurricane season, and is now calling for a near-average season with a total of 14 named storms, six hurricanes and two major hurricanes (maximum sustained winds of 111 miles per hour or greater; Category 3-5 on the Saffir-Simpson Wind Scale) (Figure 1). 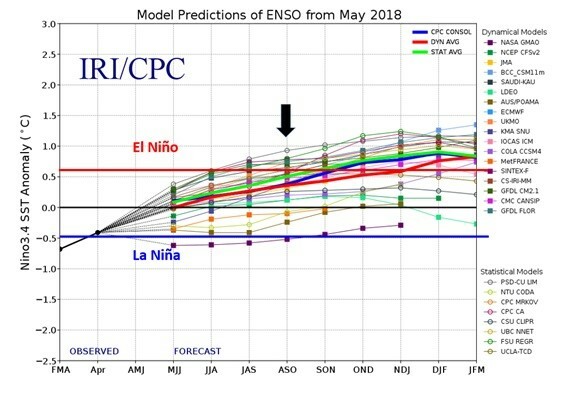 This prediction is a slight lowering from their initial outlook in early April which called for 14 named storms, seven hurricanes and three major hurricanes. Accumulated Cyclone Energy (ACE) and Net Tropical Cyclone (NTC) activity are integrated metrics that take into account the frequency, intensity and duration of storms. CSU’s meteorological team uses a statistical model as one of its primary outlook tools. 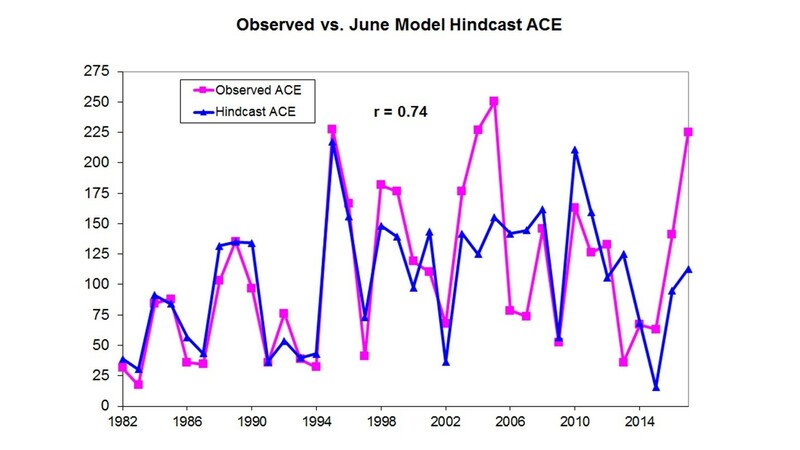 This methodology applies historical oceanic and atmospheric data to find predictors that were effective in forecasting previous years’ hurricane activity. Based on data dating back to 1982, this model has shown consistent accuracy. (Figure 2) Statistical forecast for 2018 is calling for a below-average season. CSU also employs an analog approach, which uses historical data from past years with conditions that are most similar to those currently observed (as of May 31, 2018). 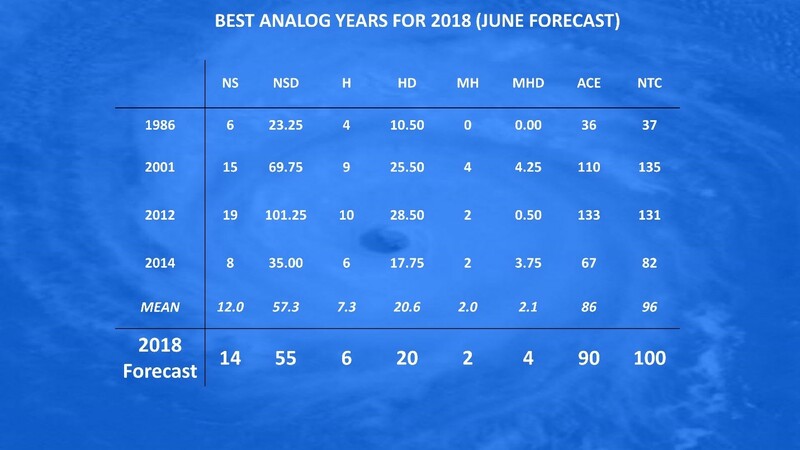 The team also forecasts projected conditions during 2018 peak hurricane season (August-October) by looking at historical data from years with similar August-October conditions. The primary reason for a reduced seasonal forecast (compared with earlier 2018 outlook), is due to anomalous cooling of the tropical Atlantic over the past couple of months. 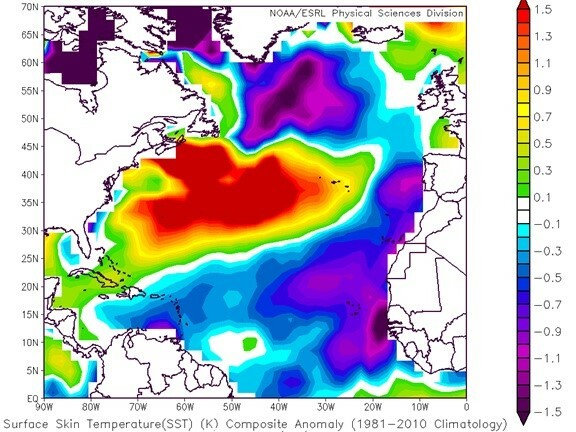 As shown in Figure 5. most of the Atlantic right now is quite a bit cooler than usual. In addition to providing less fuel for storms, a cooler tropical Atlantic is also associated with a more stable and drier atmosphere as well as higher pressure—all conditions that tend to suppress Atlantic hurricane activity. The most important thing to note with all seasonal forecasts is that they predict basinwide activity and not individual landfall events. However, regardless of what the seasonal forecast says, it only takes one storm near you to make it an active season. Therefore, coastal residents are urged to have a plan in place now before the hurricane season ramps up over the next couple of months. Extra: If you live in a hurricane-prone region, your homeowners insurance policy may have a separate hurricane deductible. This infographic explains what you need to know.